Hope's Cafe: Thymes Bath & Body Products-Review!! Thymes offers unique bath, body and home products, in an assortment of beautiful scents. 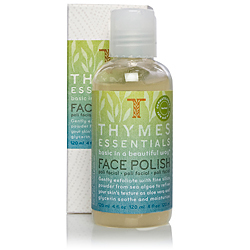 I was given the opportunity to review a couple products from Thymes...I received the Kimono Rose Body Wash, Essentials Face Polish, and the Face Lotion SPF 20. I picked the Kimono Rose scent because it sounded like a somewhat exotic fragrance, and I was right! This is absolutely one of my top favorite fragrances now! Thymes describes this fragrance as : "A sheer, sensuous floral with sweet clementine, voluptuous cassis, satiny rose, peony and jasmine petals, finished with a kiss of vanilla." All I have to say is it is definitely a very unique scent, and I am in love with it! It is a very feminine fragrance, not overly strong, but it lasts for hours! The body wash itself is a very rich formula, and using it I can definitely tell my skin is softer. It's also very moisturizing, and after using this wash I don't feel the need to use any body lotion, which is very rare for me. Generally I have to apply lotion every morning after I shower, but this is so rich I don't really have to. I really enjoyed the Face Polish. This polish is made with a fine powder of sea algae, which means it exfoliates without being abrasive. It also has aloe vera and glycerin to soothe and moisturize your skin. It has a very light fragrance of cucumber and tangerine. Even though I have somewhat sensitive skin, this face polish hasn't irritated my skin at all. It leaves my face feeling clean and fresh, without having that tight, dry feeling. I also enjoyed the Face Lotion, especially with the added benefit of it being SPF 20. It's not oily, but is quickly absorbed into the skin...leaving my face moisturized and protected from the sun's rays! "As it has been since our beginning, we strive to create products that stand apart in their uncompromising quality and attention to detail. From the way they make your skin feel, to how they restore and brighten your outlook, to the way they look on your counter or dressing table. Our goal is to create collections that are as unique and complex as you are. With expressive, evocative scents that convey style, atmosphere, personality, feeling…with beautifully designed packaging. And safe, beneficial products you can truly feel good about using and giving. And because we know that one scent doesn’t fit all, we offer an eclectic gallery of collections for bath, body and home…each with its own distinctive aesthetic in fragrance, formula, attitude and look. Celebrating your individuality and helping you find rituals that leave you refreshed and renewed." So, is you're on the lookout for some new bath and body products, or want to find a new, beautifully unique scent, I definitely recommend you check out Thymes! Disclaimer:I was not monetarily compensated in any way for this review. I did receive products for the purpose of review. All thoughts and opinions are mine, all quotes taken from the Thymes website.